Oversea-Chinese Banking Corp is paying a hefty price to expand in the People’s Republic. The Singaporean group is realising a long-held ambition by splashing out almost $5 billion for Hong Kong’s Wing Hang bank. But the deal looks expensive at a time when growth on the mainland is slowing and the U.S. Federal Reserve’s tapering is threatening to push up deposit costs. It’s no surprise that Wing Hang has chosen to sell after 77 years of family control. Despite a multi-year boom fuelled by low interest rates in Hong Kong and growth in China, the bank’s return on equity last year was a pedestrian 10 percent. But the relative shortage of local takeover targets means its value has soared. After stripping out mark-to-market gains on Wing Hang’s property portfolio, and subtracting the recently announced full-year dividend, OCBC’s HK$125-a-share cash offer values the second-tier bank at more than two times its December book value. OCBC, which has a slightly higher ROE, trades at just 1.3 times its net worth. Moreover, there’s little immediate scope to boost performance. OCBC’s presence in Hong Kong is limited, and anyway it has promised not to force job cuts for 18 months. In mainland China, where the purchase will double OCBC’s branch network, the emphasis is on expansion rather than cost reduction. 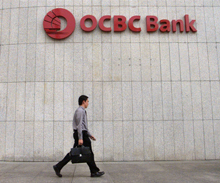 OCBC is keen to stress the growth potential from the deal. Wing Hang gives it greater opportunity to finance trade between China and other parts of Asia such as Malaysia and Indonesia, where it already has a foothold. Wing Hang’s strong funding base – loans were just 73 percent of deposits at the end of last year – is another advantage, as is its ability to capitalise on the yuan’s growing international popularity. About 17 percent of Wing Hang’s deposits are currently in the Chinese currency. Oversea-Chinese Banking Corp on April 1 made a formal offer to buy Hong Kong’s Wing Hang bank for HK$38.4 billion ($4.99 billion). The long-awaited HK$125-a-share offer values Wing Hang at around 1.77 times the bank’s published book value at the end of December. Excluding the balance sheet gains the bank has recognised for the rising value of its property, and after adjusting for the final dividend to shareholders, the price represents a multiple of about 2 times book value. The offer is a premium of 49 percent to Wing Hang’s closing price on Sept. 16, the last day before reports of takeover talks were released. Various shareholders including members of Wing Hang’s founding family and Bank of New York Mellon have accepted the offer, giving OCBC acceptances equivalent to more than 50 percent of the shares. Wing Hang, which was founded in 1937, has 42 branches in Hong Kong, 15 branches and sub-branches in mainland China, and 13 branches in Macau. OCBC said the deal, which it will pay for in cash, would initially reduce its common equity tier 1 capital ratio from 14.5 percent to 11 percent. It also promised not to make any Wing Hang employees redundant for 18 months after the deal closes. By mid-morning in Hong Kong, OCBC shares were up 0.6 percent at S$9.57. Wing Hang bank shares were up 0.24 percent at HK$123.3. Wing Hang was advised by Goldman Sachs, KPMG and Nomura. OCBC’s adviser was Bank of America Merrill Lynch.